Staff and students at Belle Vue Girls’ Academy were celebrating today after opening up their GCSE envelopes to find the strongest set of GCSE results ever to be awarded to the school. Of the 176 girls receiving exam grades, 59% achieved their combined English and Maths at grade 4 (equating to the old English grade A*- C) up from 53% in 2017 and 35% achieved the new 5+ measure in English and Maths (equating to a strong C / low B), up from 33% in 2017. 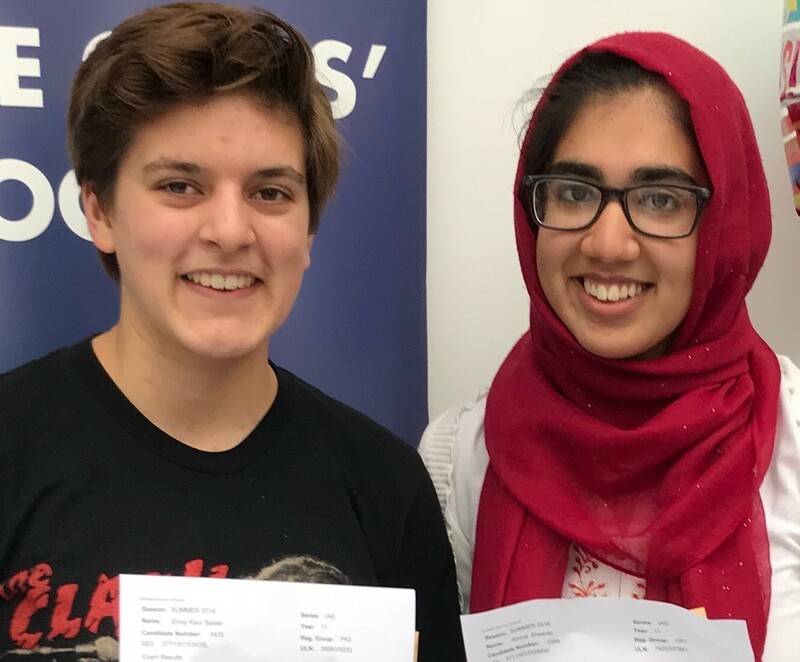 The school was also delighted to celebrate that over 200 of the very highest grades (grades 7-9, equivalent to the old A-A*grade) were awarded to the girls, with particularly strong results in English, Maths, Science and RS, putting the girls amongst some of the highest achievers in the country. Emily Baxter who achieved grade 9 in Science, French, Maths, Geography and an A* in Russian said “I’m really proud, especially of the grade 9s. It’s just a relief!” From September Emily plans to study Maths, further Maths, Physics and Computing. Belle Vue Girls’ Academy is one of three secondary academies within Bradford Diocesan Academies Trust (BDAT) celebrating improved results this summer. Students at Immanuel College in Idle and Buttershaw Business and Enterprise College also celebrated improved results this summer with Buttershaw also achieving its highest ever GCSE results at 53% and 32% for grade 4+ and 5+ respectively. Immanuel College saw grade 4+ results remain steady at 58% while their grade 5+ achievements jumped a significant 7% from 29% to 36%. As a Trust, BDAT anticipates overall achievement results will rise by at least 3% at grade 4 and by at least 5% at grade 5 this summer.